A book club that meets in a church—there is nothing remarkable about that, unless it’s like the one that meets in Bethel Lutheran Church in Madison, Wisconsin. Bethel’s Tuesday morning book club targets the homeless population in the city and is part of Bethel’s growing homeless ministry. In a little more than four years, the group has read several dozen books and enjoyed virtual and in-person chats with a diverse group of authors. 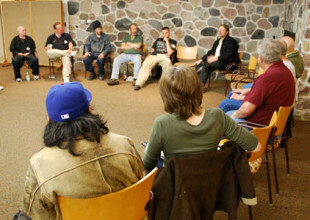 In a roundabout way, the origins of the book club can be traced to a homeless man named Eric Manley, who died on the steps of Bethel Lutheran on a bleak winter night in 2009. Eric was a friend of Mark Wilson, the manager at a nearby Taco Bell. Mark had gotten to know members of the homeless community at the restaurant. When Eric died, Mark met with Laura Sutherland, a pastor at Bethel, to arrange a funeral for Eric at the church. After the funeral, Mark and Pastor Laura put their heads together to find ways to serve the homeless in the community. Books for the group’s participants come from a variety of sources, including generous church members, The Wisconsin Historical Society Press, and the international organization World Book Night. “One day a year, [World Book Night] distributes twenty copies of a selection of books to people who are going to give them to … a community that doesn’t have regular access to literature,” Conner said. The Bethel book club has received numerous donations through the program, including one Conner chose from the list of 35 World Book Night selections. “I chose Anthony Bourdain’s Kitchen Confidential, which is a nice fun read, and a lot of people have experience in the kitchen— it’s relatable,” he said. The club meets for 90 minutes on Tuesday mornings and is led by Pastor Alison Williams. She prepares a number of questions about the week’s reading, pulling out larger themes from the reading to encourage discussion. Each week, the group, which ranges in size from two to 25, discusses one portion of the book. “A lot of times the discussion goes off topic, and that’s fine. We hit on broader issues. The last reading was The Innocent Man by John Grisham, so there were broader discussions on the criminal justice system,” Conner said. In between books, participants will either watch the movie version of the book or a movie with a theme that relates to the book. 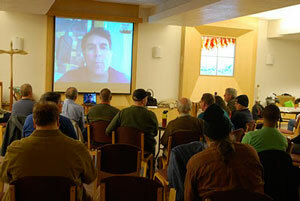 An added bonus not found in many book clubs are the Skype chats and in-person visits from authors. Not surprisingly, these visits are popular with the club’s participants. According to Conner, local author Michael Perry was a favorite for his lighthearted presentation. Up next for the club is a book in the Percy Jackson and the Olympians series, The Lightning Thief, by Rick Riordan. Bethel’s book club for homeless people is one of a handful of similar book clubs throughout the country. Conner encourages people in other communities to explore the idea. People within a homeless community “don’t have a lot of avenues to engage positively with things. … They don’t have a lot of positive outlets to really express themselves. They don’t have a lot of people really caring what they have to say … and listen[ing] to them respectfully,” he says. Bethel’s Homeless Ministry continues to grow. According to Conner, they recently received funding from Dane County to provide a permanent day center five days a week. They offer a computer lab, telephone access, clothing, information, hot coffee, and more. Madison’s homeless population was estimated at 3,382 in 2013, out of the city’s total population of approximately 250,000. Photos courtesy of Connor Wild and Suzanne Alexander. Feature photo: Luis Alberto Urrea inspires and entertains about twenty homeless participants, sharing his own hard luck stories. The group had recently read his books Into the Beautiful North and The Devil’s Highway. Inset photo 1: Michael Sallah, investigations editor for The Miami Herald and 2004 Pulitzer Prize winner for investigative journalism, skypes with the Bethel book club about his book Tiger Force: A True Story of Men and War. 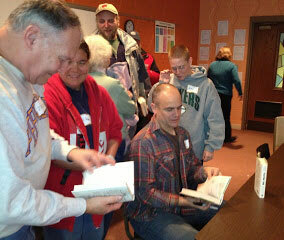 Inset photo 2: Michael Perry signs his latest book, Visiting Tom, (his fifth book and his first to make the New York Times bestseller list) and talks with Bethel Homeless Book Club friends. Mary Hertz Scarbrough reads, writes, and edits from her home in South Dakota. Connect with Mary on the web, Twitter, or email. I live in Seattle and am looking to start a book club for homeless/battered/trafficked women. I came across your book club while researching how to start the club and was wondering if you could give me advice on how to begin.